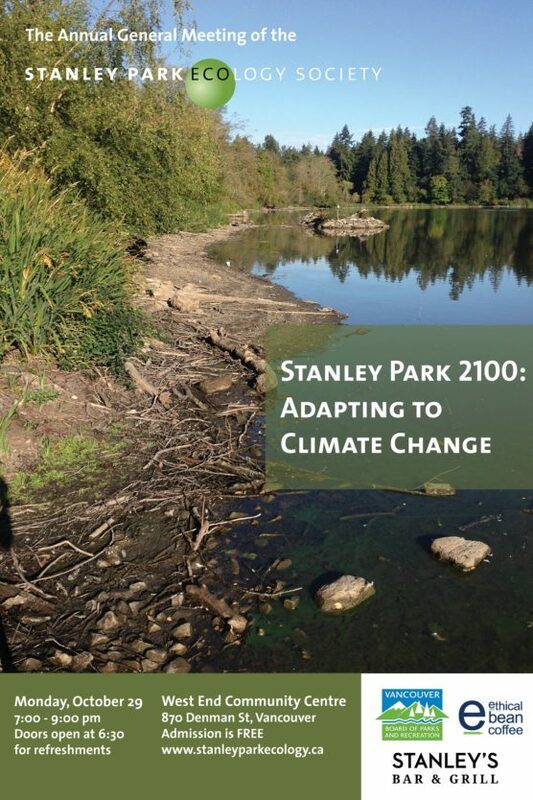 As our changing climate brings extreme weather and rising seas to Vancouver, Stanley Park’s ecosystems will have to adapt. How can we help the Park’s forests and shores survive the changes coming in the next 80 years? In this keynote presentation, two experts will address climate change, its impacts on Park ecology, and how we can prepare for the future: Angela Danyluk, Senior Sustainability Specialist with the City of Vancouver, and Bill Stephen, City arborist and author of the Stanley Park Forest Management Plan and Vancouver’s Street Tree Plan. 1. the Bylaws of the Society be amended by deleting section 11.2 of the Bylaws in its entirety. 2. any one of the officers and directors of the Society is authorized to take all such actions and execute and deliver all such documentation that are necessary or desirable for the implementation of this resolution. Members will be voting at the AGM to accept the above resolutions. You can review the Constitution & Bylaws here.